I'll admit on on a bit of a roll with vegetarian recipes as of late, focusing most of my food intake on a plant based diet. This is healthier way of life, easier on the digestion system and it makes me feel better. In these tasty little pizzas, the mushrooms give the illusion of meat while the black beans kick in for a healthy dollop of protein to keep you full and satisfied. 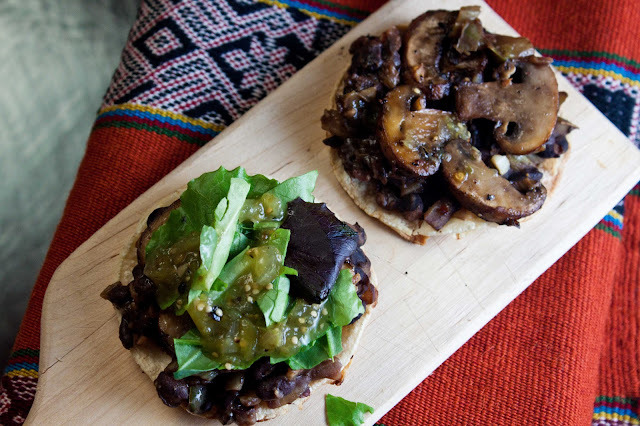 The tomatillo salsa seals the whole deal with a taste of freshness. Crispy corn tortillas substitute in for dough making the whole thing a delightful treat. Because not everyone is vegetarian, it's important that I create recipes that are layer-able - meaning you could easily add a layer of meat on without detracting from the original flavors. 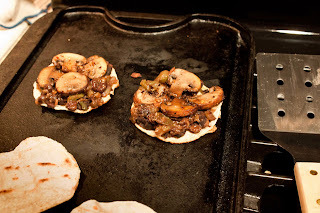 Add a little ground beef, chicken or chorizo when sauteing the onions for a meatier pizza. Try these super yummy Mexican Mushroom Pizza's today; they will leave you Fat and Happy without feeling like you need a nap because you just OD'd on a heavy, greasy, cheese-laden pie. Fat and Happy Food Blog Tips and Techniques: If you are eating meat, Fat and Happy highly suggests make a conscious effort to choose quality, organic or grass fed meats from a reputable seller. In a large sauce pan, saute the onions and celery with 1 tablespoon of the coconut oil until they begin to soften, about 5 minute. Stir often. You want to keep some crunch to the vegetables rather than cook them to full softness. Add in 1 clove of the minced garlic, cumin, chili pepper, dried oregano and a good pinch of cayenne pepper, let saute for a few more minutes. Add in the black beans with about 1/2 can of water and a sprinkling of salt. Let the whole thing simmer until any extra liquid is gone; you don't want your beans running off the tortilla so this should be somewhat thick. Taste for salt, adding a pinch more as needed. In the meantime cook the mushrooms. Heat a pan over medium high heat with 1/2 tablespoon of coconut oil. Add the mushrooms and cook until the bottom side of the mushrooms becomes a little golden brown, toss the pan, add in the garlic and continue cooking until the shrooms are fully cooked. Remove from heat and squeeze a little fresh lime juice over the whole pan. Heat a flat cast iron skillet (or large fry pan or a BBQ grill). Set the plan corn tortillas on the heat to slightly char. The tortilla will become stiff on the bottom side. Flip over to cook the second side, begin to layer the pizza together while the second side is cooking. 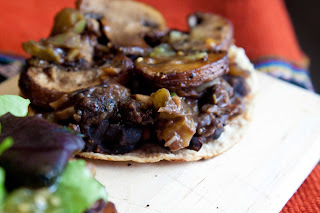 Add a big spoon of the black beans and top with the garlic mushrooms. Remove from heat, top with a little lettuce and a good drizzle of tomatillo salsa. Serve with a lime wedge.